Yes, I’m back to staring at the “Hello Betty” coin stacks, trying to determine if I want to chunk them up into smaller stacks with white sashing in between, or leave them as is. Having just been through that giant Basting Fiasco, I am underwhelmed with desire to do that all again, although I could try the board-wrap idea. Decisions, decisions. I really like the look of smaller coin stacks four or five high, separated from the others with sashing. I really like it, but it would mean a lot more work, too. On the plus side, it would make the quilt larger. 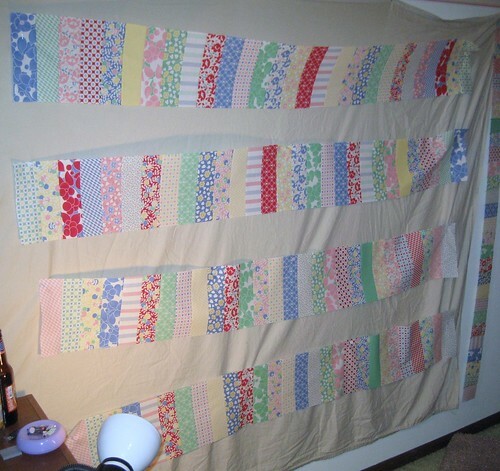 On the down side, it would make the quilt larger. I suspect, on this one, laziness will win out, and they’ll remain four intact strips. One thing at a time, though. I have approximately $TEXAS hours remaining on the hand quilting, and I need to come up with something to put in the center of each block, because I’m told leaving that much batting unquilted will result in Unpleasant Results. Perhaps tiny dog bones, as my mom is as much of a dog freak as I am.